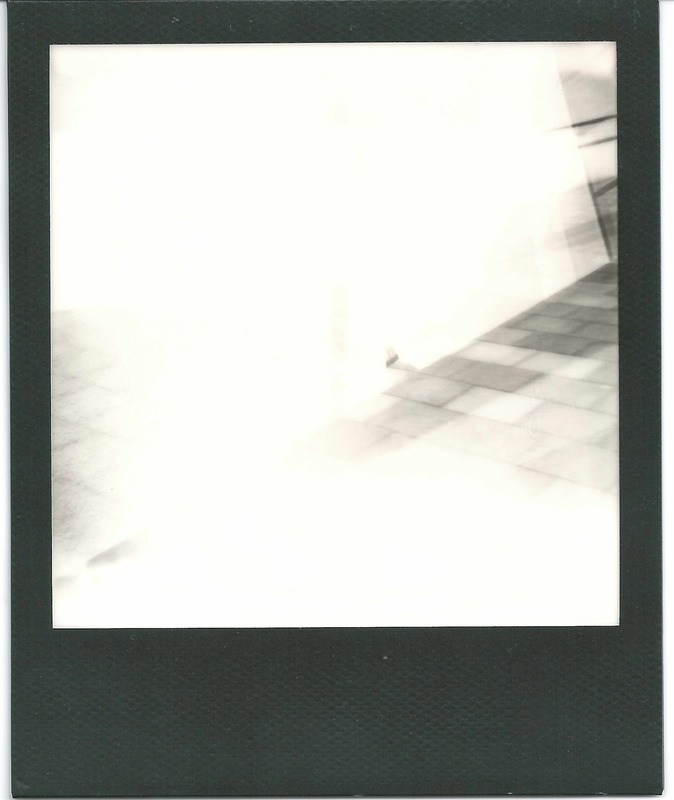 Welcome back to another iteration of Polaroid shooting Tips ‘n Tricks! This is a series full of tips for getting the most out of your Polaroid camera! Part one was about choosing the right camera and film for yourself to use. Part two is about pre- and mid-shooting techniques. It also features some of the lastest Polaroids that I took during the past two weeks! Part three is about “Preserving the moment”. Can you spot the pigeon? Yep, that’s 2,5€ down the drain. Most Polaroid cameras have relatively basic optics in them. Unless you’re shooting with an SLR 680, don’t expect the images to look perfect. Especially light / dark contrasts in images are a challenge for single-element fixed-focus plastic lenses, take this image as an example. More examples below! If you want to capture something in motion, your best option is to attempt and follow the subject with the camera, taking the image somewhere during the sweep. This can yield a reasonably sharp subject with blurred background (but might also give a completely shaky / blurry image). You’re probably better off taking the image with your smartphone or digital camera and using an Instant Lab to capture it on Polaroid. Unlike most of today’s analog and digital pictures, Polaroid 600 and SX-70 images are (obviously) square. In addition, because classic Polaroid cameras were made mainly for portrait photography, focus is sharpest in the center of the image and autofocus cameras will always attempt to focus on the center of the image. This means that most photographic rules of thumb that you might know don’t necessarily apply on Polaroid format. – The center of the image will always be the sharpest spot. – There is a slight vignette effect at the edge of many Polaroids. – Classic Polaroid cameras were made for Portrait photography with the subject in the middle. – AF cameras will always focus on the center of the image. – Be careful not to cut anything off by incorrect framing! On all non-SLR Polaroid cameras, the actual image the camera will capture is slightly to the right of what you see in the viewfinder!! When you’re arranging the subject(s), take some extra time and take some quick digital test images (LOL! Back in the 70s, Polaroids were used for test images!) to check wether the scene looks right. This will also help you with remembering when and where you took the Polaroid image. It’s no shame to rearrange chairs and people for your image since the print will cost an instant 2,5€ (no pun intended). The following shot took about five minutes of preparation and involved lots of sticky tape to keep everything in place! First attempt at taking the balcony image. Flash off, 1/3 dark. As you can see, the image is blurry and too dark overall. On top of that, I accidentally bent the image during ejection, resulting in white marks all over the image. Second shot, perfect result: Flash on, exposure slider in the middle. The flash really helped to surface all the details in the scene. With everything set up and ready to go, it’s time to press that shutter button! On 600 cameras, use the small black tab under the red button to take the image without flash. That’s it for this part of “Polaroid shooting Tips ‘n Tricks”! To read the third and last part, click here. To stay up to date with posts on CONATH.me, either follow me on Twitter or Facebook or sign up for the email newsletter. Please share any additional tips and thoughts in the comments below! Hey, y’all, and how’s it going? As I promised earlier, here’s a series full of tips for getting the most out of your Polaroid camera! Part one is about choosing the right camera and film for yourself to use. Your best choice: a 600 box-type camera. Any model in good condition will do, but cameras with CL (close lens) or AF (autofocus) features can take sharper images. It might be time to upgrade to a more professional camera. If you don’t already have one, you should now get a CL or AF-equipped camera. For even better image quality, consider getting an SX-70 camera. The film speed is slower on those but also shows more detail than 600 and Image/Spectra images. If you’re looking for one of the most iconic Polaroid cameras, have a look at the SX-70 Sonar Land Camera (not at the price tag tho…).If you’re looking to change things up a bit, why not try an Image / Spectra camera? The images are slightly wider than normal Polaroids and share film characteristics with the 600 film (see below). 8×10 cameras / film are the perfect fit for you. This format allows for advanced shooting techniques and uses some of the best cameras. What camera I use, you ask? I am using a Polaroid Autofocus 660 camera because it’s robust and produces very sharp images – even sharper than my previous camera, the 600 CL. After choosing your camera, the range of suitable films will be limited to the type of camera: SX-70, 600, Image/Spectra or 8×10 film. SX-70 film has a film speed of ASA/ISO 150. This gives for a big amount of detail while reducing the chance of overexposed images e. g. when shooting outside as the film is generally less sensitive to light than 600 or Image / Spectra film. This, however, is also a downside of SX-70 film, as slower film speeds require longer shutter speeds in order to achieve bright images. If you’re feeling very adventurous, you can try using an Neutral Density filter plus 600 film in your SX-70 camera. Tldr; hold your camera steady and you can get impressive results! Image/Spectra film is chemically identical to 600 and therefore shares characteristics and film speed. The image area is slightly wider on this film, producing wide-format rectangular results. Great for capturing a landscape in a single shot. 8×10 Film is the only choice if you’re using an 8×10 camera. The film speed is about 600 ASA/ISO. In my opinion, this is one of the most difficult pre-shooting decisions. It depends on the motif you’re planning on shooting. If you’re going to take pictures of very structural subjects like buildings and abstractly looking scenery, black and white film can help to direct the viewer’s attention to shapes instead of colors. B&W images can also have a darker atmosphere and tend to look more old-fashioned than colored ones. On the other hand, taking a picture of the colorful flowers in your garden doesn’t necessarily make sense on b&w film. You get the idea. That’s it for part one of this series of Polaroid shooting Tips and Tricks. Check out the other posts in this series: part two “Capturing the moment” (pre-shooting and mid-shooting techniques) as well as part three “Preserving the moment” (post-shooting tips including development, modification and storage of the images). Got tips to share with everyone? Feel free to do so in the comment section below! Please make sure to have a look at my previous posts and follow me on Twitter or Facebook to get notified when new ones arrive!